Anthony T. Maurelli, Ph.D. is Professor and Associate Chair of the Department of Environmental and Global Health. He received a B.S. in Biology from Villanova University, Villanova, PA in May, 1974 and a Ph.D. in Molecular Cell Biology in June 1983, from the University of Alabama in Birmingham, Birmingham, AL. After his Ph.D. work, Dr. Maurelli spent three years as a Postdoctoral Fellow and Chargé de Recherche in the Service des Entérobactéries at the Institut Pasteur, Paris, France. In 1986, Dr. Maurelli accepted a position as Assistant Professor in the Department of Microbiology, F. Edward Hébert School of Medicine, Uniformed Services University of the Health Sciences, Bethesda, MD. He was promoted to Associate Professor (with tenure) in 1992 and then to Professor in 1999. He held joint appointments as graduate faculty in the Molecular and Cell Biology and Emerging Infectious Diseases Graduate programs. Dr. Maurelli joined the Department of Environmental and Global Health, College of Public Health and Health Professions, University of Florida in January 2016. 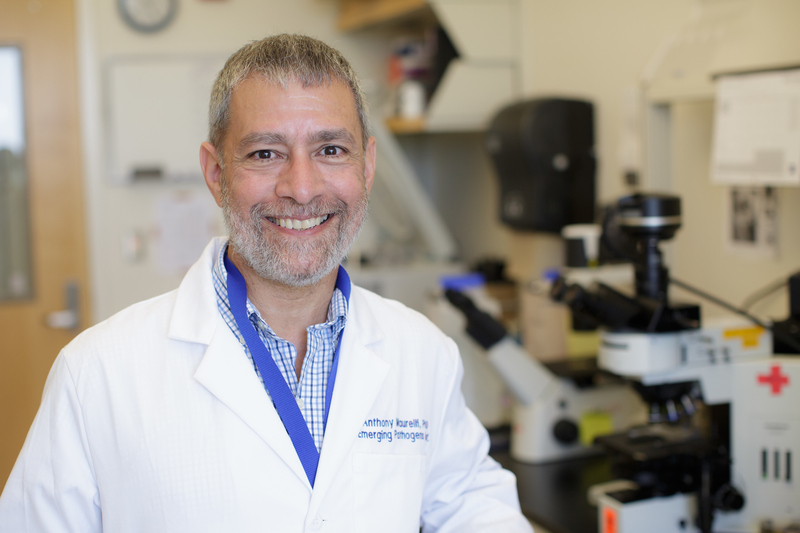 He is also on the faculty of the Emerging Pathogens Institute (EPI) and affiliate graduate faculty of the Molecular Genetics and Microbiology Department of the UF College of Medicine. Dr. Maurelli is a Fellow of the Infectious Diseases Society of America and a Fellow of the American Academy of Microbiology. He is a member and serves as Secretary-Treasurer of the Chlamydia Basic Research Society. Dr. Maurelli is Mini-reviews Editor for Infection and Immunity and has served on grant review panels of the NIH both as reviewer and Chair. Dr. Maurelli directs an active, NIH-funded, basic research program in his laboratory at the EPI in Gainesville where his team studies molecular genetics and pathogenesis of Chlamydia and Shigella. He also works at the UF-EPI Haiti Labs in Gressier and Baradères, Haiti. He has had continuous funding from the NIH for over 20 years. Development of genetic tools for studying Chlamydia spp. and their application to analysis of pathogenic mechanisms of Chlamydia spp. Cell wall metabolism and cell division processes of Chlamydia spp. Mechanisms of antibiotic resistance in Chlamydia spp. Liechti, G., Singh, R., Rossi, P. L., Gray, M. D., Adams, N. E., & Maurelli, A. T. (2018, April 03). Chlamydia trachomatis dapF Encodes a Bifunctional Enzyme Capable of Both d-Glutamate Racemase and Diaminopimelate Epimerase Activities. Lampel, K. A., Formal, S. B., & Maurelli, A. T. (2018, January). A Brief History of Shigella. Hazen, T. H., Leonard, S. R., Lampel, K. A., Lacher, D. W., Maurelli, A. T., & Rasko, D. A. (2016, July 21). Investigating the Relatedness of Enteroinvasive Escherichia coli to Other E. coli and Shigella Isolates by Using Comparative Genomics. Liechti, G., Kuru, E., Packiam, M., Hsu, Y. P., Tekkam, S., Hall, E., . . . Maurelli, A. T. (2016, May 04). Pathogenic Chlamydia Lack a Classical Sacculus but Synthesize a Narrow, Mid-cell Peptidoglycan Ring, Regulated by MreB, for Cell Division. Bliven, K. A., & Maurelli, A. T. (2016, February). Evolution of Bacterial Pathogens Within the Human Host.